I’m a partisan but have been making, I hope, fair comments about the Republicans and the way they are enabled by the mainstream media, thanks primarily to the toxic relationship of both with Fox News. 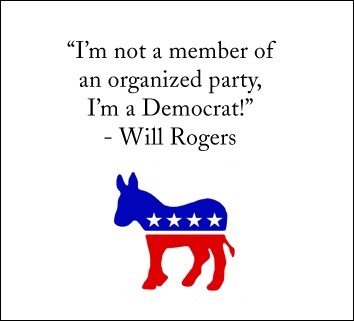 However, there is an x factor that the Democrats never fail to contribute and is best expressed by the quote, reproduced above, by the great American humorist, Will Rogers. That’s not to draw a false equivalence: the Republicans are unregenerate cynics perpetually on the take from rapacious corporate interests whose lobbyists now write “legislation” whenever Republicans hold a majority. But it would help if the Dems were not such trembling feebs when it comes to a fight it matters to win. Does anyone think, for example, that just because the Dems did not prosecute the Bush administration for the war crimes it undoubtedly committed, the House Republicans will not now use its restored subpoena power to create the impression that Democrats are responsible for every crime dating back to original sin? The Republicans are unsurpassed at the narcissistic art of projection: they attribute to the Dems the crimes they are actually guilty of and thereby inoculate themselves against accusation. If the Democrats had bothered just to investigate the Bush administration and exposed its crimes until they could no longer be credibly denied, that’d have been much harder to ignore on Tuesday. Remember the impeachment of Bill Clinton and the ultimately bogus Whitewater “scandal.” That is always how it’s played. Minority Senate leader Mitch McConnell of Kentucky declared late in the campaign that his one priority is to “ensure that Obama is a one-term president.” That’s the priority. Not the stagnant economy. Not nighmarishly chronic unemployment. Not the unimaginably vast corruption on Wall Street. Not two losing wars in Iraq and Afghanistan. His one fully declared aim is to destroy the Obama presidency. And he’ll do that while pursuing an agenda to maintain a ridiculously low and crippling tax rate for the richest 5% of the population; and he’ll do that while refusing to cut entitlements or defence spending. Because although the Teabaggers talk a good game about fiscal responsibility, it’s clear they want their entitlements: they just don’t want others (people with dark skin, the poor, the young) to have them. Again, the Republicans are nihilists, the party of nothing. And, as Edmund Spenser observed, that kind of evil is a sort of inflated absence of goodness that requires just one prick to make it pop into its proper non-existent state. That makes being a prick in this instance a virtue. This entry was posted in Current Events on November 4, 2010 by Michael Happy.